Released back at the beginning of 2011, the LifeSpan Fitness TR3000i Folding Treadmill still holds up well today with modern features and a more than competitive price of $1,499.00. Some of the primary and stand-out features include a useful EZ drop folding system, a deck that supports up to 350 pounds and training programs that include weight loss, sports training, healthy living and heart rate programs. Consumers will also find that the treadmill comes with a high-tech multicolored LCD system that can track everything from calories burnt to distance ran, as well as the time spent running. The drive motor used within the treadmill runs at a high 2.75 horsepower, while consumers have the ability to switch speeds between 0.5 and 12 mph, which is great for those that like to have a bit of variety on their workouts. The incline can also be raised to 15, which can substantially alter a workout routine. Both the speed and incline controls are placed on the handles of the treadmill, making it very easy to create a dynamic workout. One of the most useful aspects of the treadmill is the fact that it is exceedingly quiet. By all accounts, it’s not even necessary to raise the volume on a TV or MP3 player while working out, as the drive motor is designed to make the least amount of noise as possible. The 17 preset apps available on the treadmill at purchase are varied and offer a number of useful workouts, as well as 2 heart rate control programs and 2 customizable programs. The customizable programs are particularly innovative in that they allow the user to set up a workout goal, while the machine will then alter speeds and incline in order to compensate during the routine. Folding the treadmill after use is easy and helps to save a good deal of space. This can come in handy for those with apartments. The LCD display screen is modern and contains everything that users will need in order to have a successful workout. Located on the display are a number of important sections that give the user information during a workout, including calories, incline, speed, distance ran, heart rate, steps taken and time spent working out, all of which is displayed in a large and easy to read font. One of the biggest cons about this treadmill is the process of putting it together. While the basic assembly comes with clear directions, the machine itself is very heavy, weighing at a hefty 221 pounds, which can make it difficult to maneuver around the home. The general interface of the treadmill, such as the buttons and preloaded programs, can be busy and confusing. The many different buttons on the machine can be difficult to remember. It’s also important to note that the only way to enter customized stats onto the treadmill is by installing an app onto a computer and using a USB to transfer those stats to the treadmill, which can be a laborious task. Although the horsepower of this treadmill is relatively high at 2.75, many treadmills around the listed price of this one tend to have a horsepower that ranges from 3.0 to 3.5. 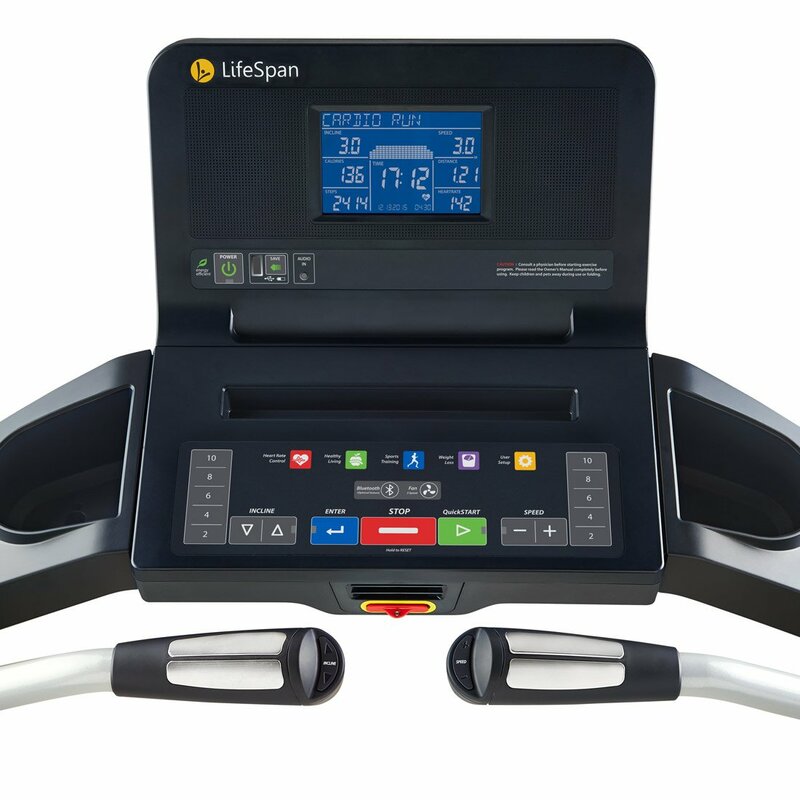 The LifeSpan Fitness TR3000i is a highly innovative treadmill that comes with a large number of features that help to improve the user experience while working out. 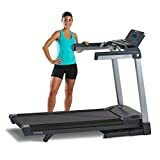 The treadmill, which comes in a dual light and dark grey color palette, includes a lengthy 20 inch by 56 inch running surface, making it spacious enough that no consumer will ever feel as though they need extra space to move around. While the TR4000i at $1,800 and the TR5000i at $2,000 may be a better choice for those that can afford the higher costs, the value of the TR3000i by LifeSpan Fitness is likely better due to comparable features and a lower price. Though there are a couple of niggling issues with the treadmill, the good far outweighs the bad and will provide the consumer with one of the finer treadmills around.